Holiday time is almost upon us, time to de-stress and take a break. But what about the other 50 weeks of the year, how are we managing our stress and what are the implications? What exactly do we mean by stress? Anything that causes a ‘fight or flight’ response in the body, a sympathetic nervous system reaction that prioritises subsequent action. This is a natural survival instinct that would have kicked in at times of impending danger. Whilst I doubt many of us have been chased by a sabre toothed tiger, everyday modern stressors provoke the same response in the body and for many people this is going on around the clock. An adrenal response includes an increase in secretion of the stress hormone, cortisol, many of us may be familiar with cortisone, its anti-inflammatory component. This is a normal response, the body has to adapt to the situation and will do so whether our life is being threatened or we are simply stuck in traffic, from a biochemical perspective stress is stress, we have an innate resilience to it and actually need it some extent to build greater resilience. Problems occur however due to the chronic nature of present day stress, for many of us it is 24/7, compare that to nature where once the hunt is over, the survivor goes back to grazing. 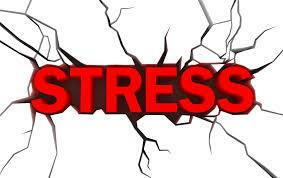 The adaptation to acute stress becomes a maladaptation with chronic stress. Over long periods of time in a state of constant ‘fire fighting’, the adrenal response, the signalling and feedback loops begin to falter, we develop something akin to ‘cortisol resistance’ and our resilience starts to diminish. Ever noticed how you don’t quite bounce back after a challenge/negative event the way you once did? The bottom line is that under stress the priority is fight or flight, survival of the organism! As such, every other system in the body becomes secondary in importance. Typically the immune system weakens, digestion becomes impaired, thyroid and energy production become sluggish, weight management is more difficult and folk can’t get to sleep. Your body is not interested in digesting food, detoxifying the body, fighting infection, creating sustained energy and switching off when running from a predator, but unfortunately neither is it when stuck in the chronic stress response. -Be mindful of your lifestyle. You may be an ‘adrenal junkie’, a type A who burns the candle form both ends, but at some point a crash awaits. -Take ‘time out’ during each day, whether it’s just relaxation, quiet time or simple meditation. -Practice the art of doing nothing occasionally, take a digital detox even if just for a few hours a week with the phone switched off. - For every withdrawal, put in a deposit. Do something that replenishes, have a regular massage, a chiropractic adjustment or a Tai Chi session…. -Exercise optimally, customize training for you. Avoid over-exercising and be especially cautious with prolonged aerobic exercise, which despite the positive feelings associated with the endorphin effect, can be a major stressor to the body. Train, don’t drain! -Develop an optimum sleep/night time routine. -Avoid/reduce chemical exposure in foods, skincare, cleaning products. -Reduce intake of caffeine, processed foods, sugar, unfermented soy, white flour, table salt and alcohol and eat right for your type. -Learn to say ‘no’, we all want to be helpful but we can only give so much. -Surround yourself with positive people, be wary of the energy ‘drainers’. …And above all why not just try feeling good for no good reason!